Stacking the Shelves is a weekly feature, hosted by Tynga's Reviews, where we get to share all the books and bookish things we have recently acquired. Today I am sharing with you my April book haul! I know your all saying, "but Justine isn't it a little late". I am always late on my book hauls, I'm sorry! I even took these photos over a month ago and they have just been sitting on my computer. I did just get back from BEA though and all my new books have pushed me to start getting better at my book hauls. I will probably posting my BEA haul next week so stay tuned for that exciting haul! I was lucky enough to win an ARC of Simon vs. the Homo Sapiens Agenda by Becky Albertalli from Epic Reads. I read it immediately and trust me when I say this one is a must read! This Book Outlet order actually showed up on my doorstep back in March but I had technically ordered them as a birthday present for myself so my dad made me wait two whole weeks to open them! The box literally would just sit in my living room each day taunting me! Also, for my birthday my parents were very nice and set me free reign in the bookstore letting my pick out 3 books they would buy for me! 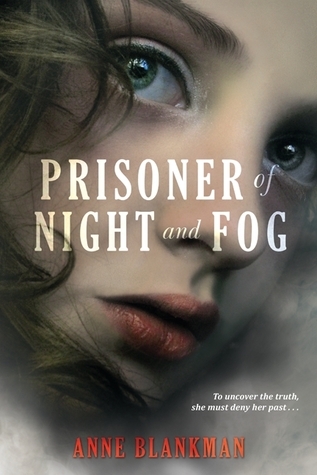 You will probably recognize this is the sequel to Prisoner of Night and Fog which is shown above. I love this series so much that I went out and bought Conspiracy of Blood and Smoke by Anne Blankman the day it came out. The beauty An Ember in the Ashes by Sabaa Tahir showed up on my doorstep at the end of the month after I won it from Jen over at YA Romantics. What books have you recently added to your shelves? Have you read any of my latest additions? What did you think of them? Don't forget to tell me in the comments below!